It’s a SAD World, but It Doesn’t Have to Be. that there is a cure for SAD (Seasonal Affective Disorder)? Yes, you heard right. 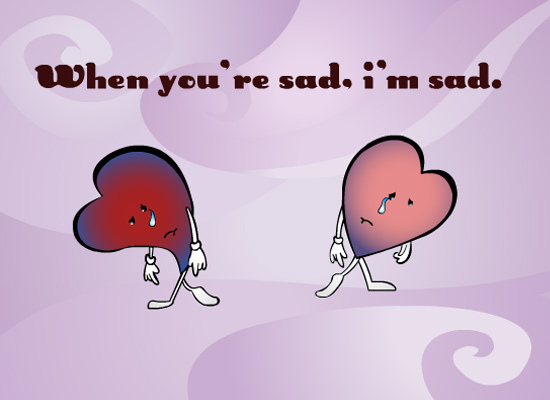 The sad thing about SAD is that it affects a lot of people, and comes up in February, creating a lot of disorder on and around Valentine’s Day. It’s no surprise that chocolates are one of the favourite gifts at Valentine’s as certain components of chocolate (the real stuff, not the pretend chocolate) help to alleviate the symptoms of SAD. But while chocolate may help, it can’t cure the underlying cause, which in Heilkunst, is often linked to another of the chronic disease archetypes we bring into this world with us, called Ringworm. In Ringworm the state of mind is “wants to but can’t”. People suffering from the Ringworm chronic miasm would feel caught in things–that they couldn’t do what they want to do. Even just the thought of doing something immediately seems to bring itself down. They feel they can never meet the expectation of family, friends and society. They have strong dependence on someone they trust and they are very loyal. But then they depend on their loved ones to function. They feel trapped. This is the ‘February blah’s’ or seasonal affective disorder (SAD). Even the bowel movement shows the characteristic. It is bashful: wants to but recedes. They procrastinate and can never finish something. They are comfortable staying at home. Physically this is the misnamed “seasonal disorder” syndrome. It is a progression from the untreated chronic miasm Tuberculosis. It is caught in the incredible inertia of the winter month of February. Classically, ringworm is well known as a skin problem. The skin lesion, which is fungal (people sometimes think it is a parasitic worm), is usually circular (but not always) and can be itchy. It used to be quite common in children and produces a characteristic eruption, a round patch of reddish/purplish raised, rough skin that looks like it has worms in it. Ringworm as the skin problem has become rare in our days but continues nonetheless in the more suppressed form. Acute ringworm skin problem can be treated acutely in various ways, drug and herbal related, including the simple use of apple cider vinegar, and, of course, using homeopathic medicines. But, the chronic form is less easily recognized and even less readily treated other than in Heilkunst. Chronic ringworm can also manifest as a skin condition (not generally itchy), but more likely in psychological terms, such as a certain angry irritability that comes from the underlying keynote of ringworm, which is “wants to and can’t”. This means that the person is motivated to do something, but then loses all energy/motivation to carry out the wish, creating an internal frustration, but also a certain feeling of negativity that makes them feel and look depressed. It can involve constipation, lack of energy, and digestive issues as well (hunger, but difficulty digesting what is eaten). If you feel trapped and irritable especially around Valentine’s Day, chances are you might be suffering from this chronic disease pattern. Don’t want to be SAD any more? Consider getting rid of SAD, and getting Heilkunst treatment. And if you still want the chocolates, that remains an option. Valentine’s Day is not as far away as you think. There’s still time to take action! Why Am I Always on the Move but Never Seem to be Satisfied? that tuberculosis is also an inherited disease pattern, which we call a chronic miasm? Just as malaria, which we are familiar with in an acute form, now mostly exists in its chronic, hidden form, the Malarial miasm, so tuberculosis has largely disappeared in its acute form, but still plagues man as a chronic miasm. If you suffer from the usual ‘colds and flus of the season’, often making the Christmas holiday period and the weeks after more miserable than joyful, you are suffering from the underlying impact of the Tuberculosis miasm. Other lung problems, such as bronchitis, pneumonia, and various coughs, are also largely linked to the presence of this chronic disease pattern in your life, or that of family members. Tuberculosis (miasm) can manifest physically in any part of the body, although the key organ affected is the lungs. This relates to the fact that the issue of Tuberculosis is a lack of grounding and incarnation and lungs are the organ related to the earth element. They feel better at high altitude, but they are then caught in a conflict as their heart feels worse in the mountains. Tubercular children are active, restless, and destructive in a deliberate and selective way. Tuberculosis has a characteristic state of mind – one of restlessness. Tubercular patients only seem to feel well if they are planning travel or change, preparing for travel or change or actually undergoing a change in routine. Once settled, they seldom stay content for long, seeking again another destination to travel to (racking up the frequent flyer miles), another place to live, another job to do, a new hobby to follow. These are people seemingly on the move, but not with any deeper purpose than the move itself. For them it is more ‘change for change’s sake’. They can be constantly rearranging furniture, redecorating, renovating. A darker side of Tuberculosis is a sudden impulse to break or destroy something. They can present as an ‘angel with a devil’s grin’ on occasion, usually more apparent in children, but discernible still, if more subtle and disguised in adults. If you suffer from lung problems, constant or persistent ‘colds and flus’, particularly in winter, and feel restless, never really satisfied, suffering from ‘the grass is greener on the other side of the fence’ syndrome, then you would likely benefit from treatment for the chronic miasm we call Tuberculosis. Relief is as close as a Heilkunst practitioner near you (and now, with the internet and Skype, relief is just a nano-second away!). Stay tuned. Next we will look at a little-know, but important and difficult miasm that often upsets Valentine’s Day. that we have certain archetypal disease patterns that we bring into this world with us, and that lie at the root of many of our health problems? You did if you have been reading these blogs regularly. Our last blog spoke about the first of these chronic inherited disease archetypes, Psora. The theme of Psora is that of a poverty consciousness. If you have been reading these blogs, you would also know that the chronic miasms have a certain order to them in the way in which they developed, and also how they are treated in most cases. After Psora, the first of the chronic miasms, we find Malaria. Malaria used to be endemic around the world, including in Europe and North America, as an acute disease, but is now confined to only a few, mostly tropical places. In most of the world, acute malaria is gone, but has become a chronic, largely unknown disease, producing and hiding behind many acute conditions that are given fancy names, from Greek or Latin, based on the main symptoms. These conventional ‘names’ aren’t very helpful as they don’t tell us or the person seeking to treat them what the cause is, so treatment amounts to suppressing the symptoms. But the underlying cause remains, and the disease(s) continue, just now deeper inside you and getting stronger as you get weaker. It’s ‘healthcare by proxy’ or ‘healthcare by hook or by crook’ – if you can’t get rid of the cause, then get rid of the evidence and pretend you fixed the problem. Malaria produces many conditions involving the digestive system, in particular the liver. And the liver is the basis for our energy, our ability to digest food, but also life in general. With a weak liver, we also tend to feel generally weak, unable to handle the demands of the world, and psychologically, we start to feel like we are victims and the world with its many demands is oppressive and unfair. The characteristic time for Malaria to manifest in most people is in the late Fall, from late October to early December, following the season of Psora (early Fall). The state of mind of Psora, of not having enough, coincides with the waning days of summer, the approach of the colder weather, shorter days, less sunshine, and the dying of nature’s vegetative cover of the earth. Malaria then follows, with the colder, damper and stormier days of late Fall, where we feel like nature is against us, the reprieve of ‘Indian Summer’ now gone and the harshness of winter soon to come upon us. Of course, these chronic miasms are not dependent upon the weather, and can manifest regardless of geography. To an experienced practitioner, the manifestations of each of the chronic miasms can be seen in the various symptoms that can flare up at certain times of the year. Every November, I used to get depressed by the damp, cold weather, get periodic fevers and feel very cold, seeking out warmth and feeling generally like the world was not a welcoming place. These symptoms were very familiar to me, as I had contracted malaria, the acute disease miasm in my youth when working and travelling in Asia and the Pacific. I had treated for the acute malaria, but the deeper, underlying chronic malarial miasm was still there. However, once I learned about it and treated for it, my seasonal malarial symptoms also ended. Treating for Malaria, as for Psora, and all the other chronic miasms we’ll talk about can make a large difference in your overall health, and prevent other problems from emerging later in life. Even if the chronic miasms are not affecting you seemingly now, they are latent, and waiting to be activated by some event, and once activated can cause significant health issues. Next time we’ll talk about the chronic miasm following on Malaria, Tuberculosis, behind all the colds and flus we tend to suffer from in winter. Stay tuned.